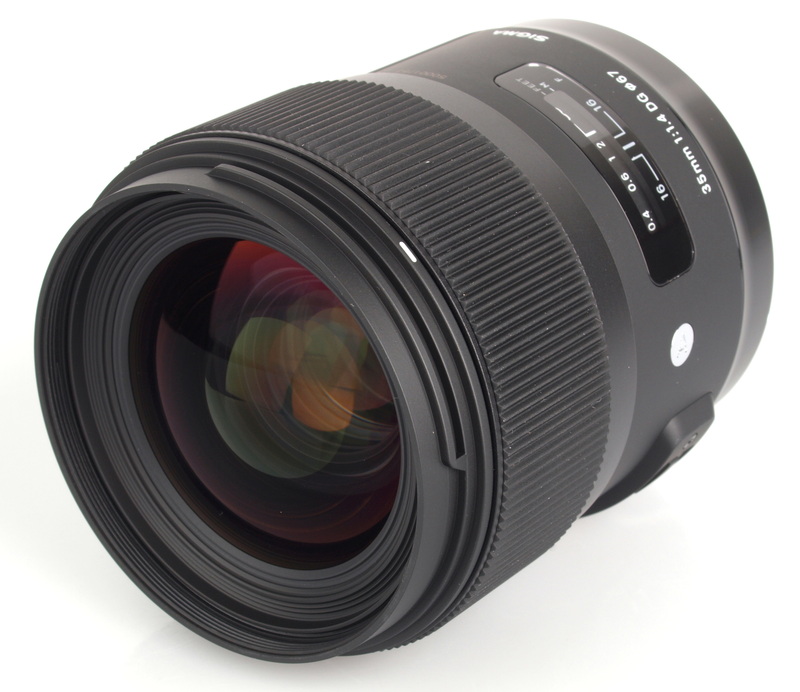 Gary Wolstenholme reviews the Sigma 35mm f/1.4 DG HSM Art lens. This lens is the first of Sigma's new 'Art' line of lenses that promise excellent optical quality and increased creative options thanks to a fast f/1.4 maximum aperture. 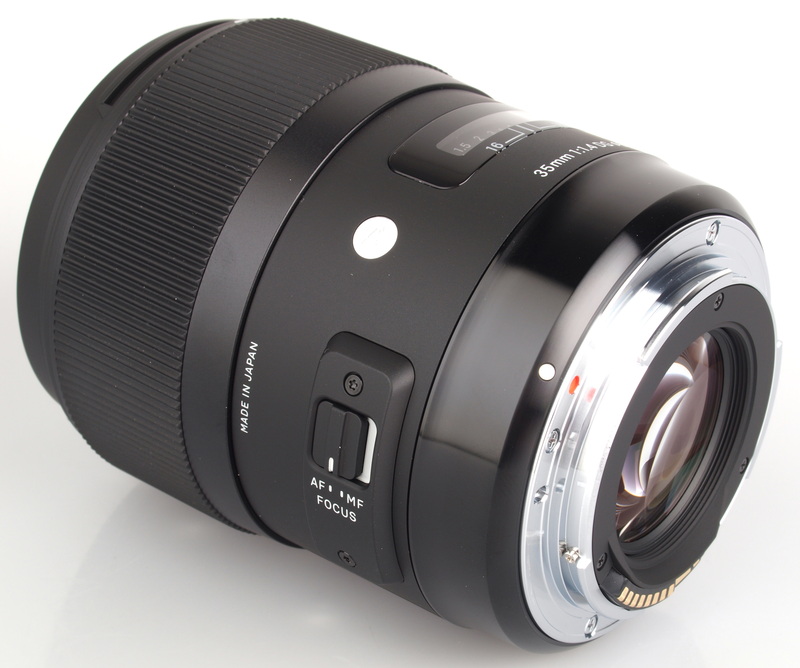 Being one of Sigma's top of the range lenses, it sports a hypersonic focusing motor, brass lens mount and build quality normally reserved for their EX line of lenses. Weighing around 660g, this optic is ever so slightly heavier than equivalent optics from Canon and Nikon. This coupled with the high quality matt finished plastics used for much of the construction, and brass lens mount, add to the overall robust feel of the lens. The lens balances well on the Canon EOS 5D used for testing but may feel a little lens heavy in combination with some of the more compact SLR bodies available today. A silent HSM focusing motor powers the focusing mechanism, resulting in quick focusing in a wide range of conditions. 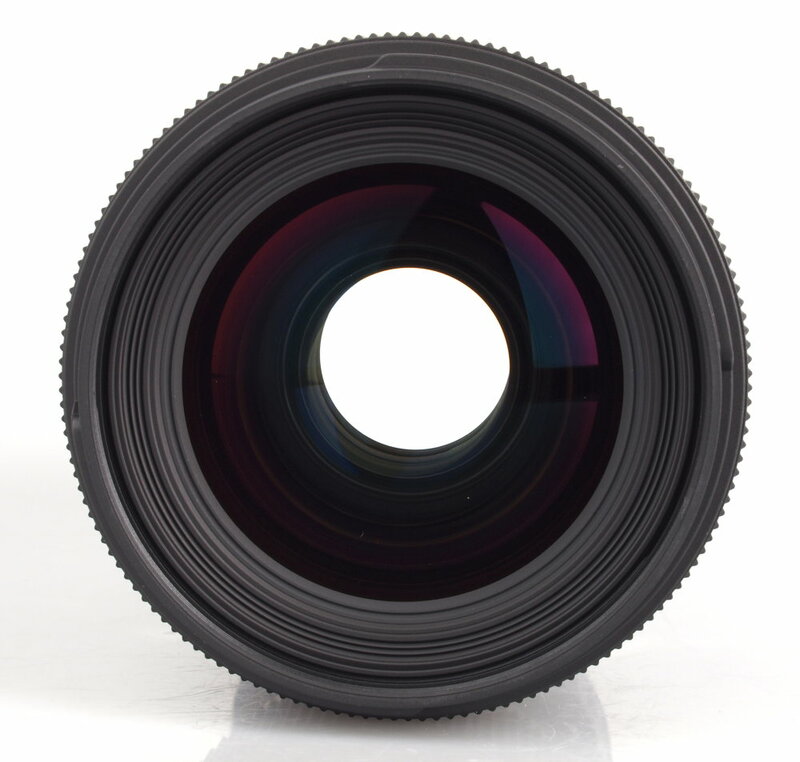 Focusing is performed internally, so the 67mm filter thread does not rotate, making this lens ideal for use with polarising and graduated filters. Full time manual focus adjustments are supported by simply adjusting the focus ring at any time. Manual focusing is a pleasure as the focus ring is well damped, and very smooth to operate. The close focusing distance of 30cm is fairly typical of this kind of lens. Even at f/1.4, sharpness in the centre portion of the frame is excellent, although as you might expect at such a fast maximum aperture, sharpness towards the edges of the frame falls away to just below good levels. This is still very good performance for a lens of this type. Stopping the lens down improves sharpness across the frame with clarity towards the edges of the frame reaching very good levels by f/2. Peak sharpness across the frame is achieved at apertures between f/4 and f/5.6 where the clarity achieved in the centre is outstanding, and sharpness is excellent towards the edges of the frame. 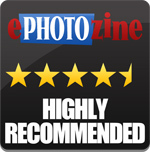 For this review, the lens was tested on a Canon EOS 5D using Imatest. 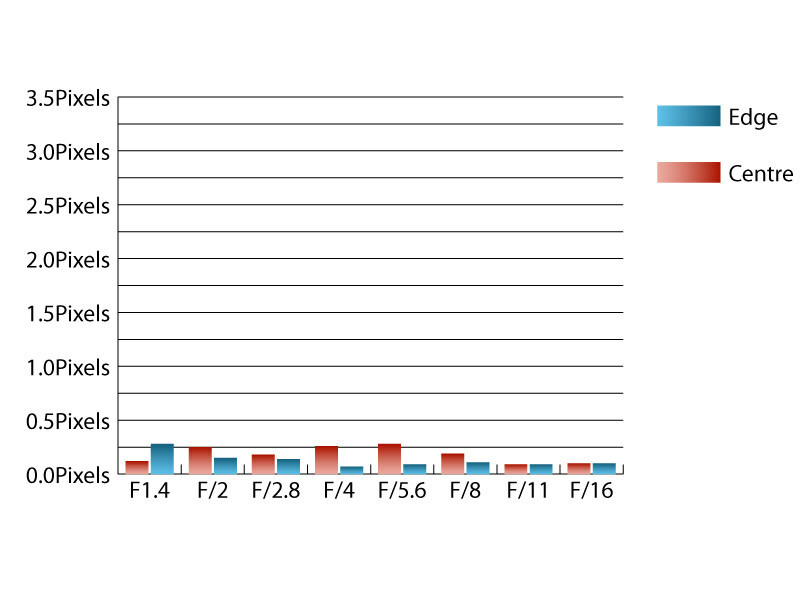 Chromatic aberrations are extremely well controlled, barely exceeding 0.25 pixel widths at any aperture. This extremely low level of CA should pose no issues, even in large prints, or harsh crops from the edges of the frame. 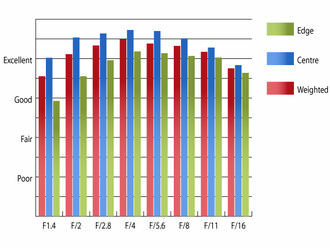 As you may expect from a lens with a fast f/1.4 maximum aperture, falloff of illumination is quite pronounced. At f/1.4 the corners are 2.83 stops darker than the image centre and visually uniform illumination isn't achieved until the lens is stopped down to f/4 or beyond. Barrel distortion can be quite common on wide aperture lenses like this one. 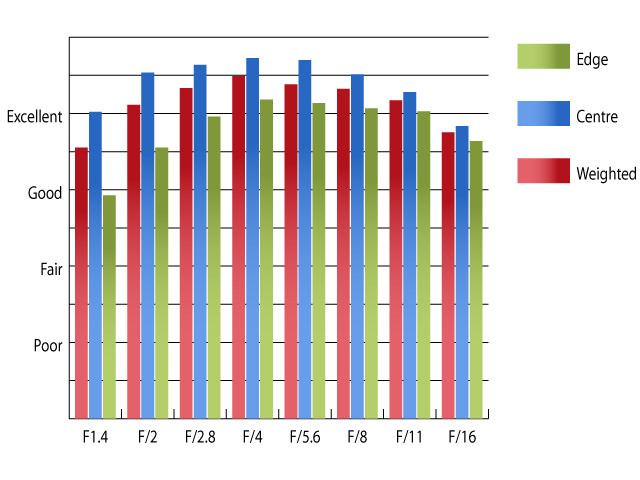 This lens only displays 0.688% barrel distortion, which should pose few issues in normal use. If absolutely straight lines are paramount, then you'll be glad to hear that the distortion pattern is uniform across the frame, which should make applying corrections in image editing software fairly straightforward. A petal-shaped hood is supplied as standard with the lens, which does a good job of protecting the front element from extraneous light that may cause unwanted flare and loss of contrast. During testing there were no issues with flare and contrast holds up well, even when shooting into the light. Priced at around £780, this 35mm f/1.4 lens from Sigma appears to offer excellent value for money when compared to equivalent lenses from other camera manufacturers. Equivalent lenses from Nikon and Canon both offer sealing against moisture on top of what the Sigma lens offers, but they are both more expensive. 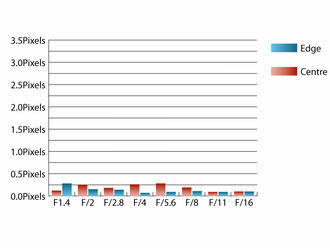 Canon's 35mm f/1.4L USM costs around £1080 and Nikon's 35mm f/1.4G is even more expensive at around £1300. Sony also offer a 35mm f/1.4 lens, which lack weather sealing and a silent focusing motor, but is still more expensive than the Sigma lens at around £930. The Sigma 35mm f/1.4 lens offers excellent sharpness at a good price. Sigma appear to have everything right with this new lens. It delivers excellent optical quality, at a tempting price point that is quite a bit cheaper than the competition form the likes of Canon, Nikon & Sony. What is impressive is that they seem to have been able to achieve this, without cutting any corners. Those looking for a wide aperture lens at this focal length will do well to add this lens to their list of lenses to consider.